Fresh, bright and cool, this watermelon-cucumber concoction makes a great summer salad. Photo by Fran Hill. I thumped my melon on the 4th of July. Actually, I first thumped it a few days earlier when doing the shopping for our holiday get-together. At the grocery store, I dug into the vast crate of green, striped watermelons, turning them one by one to look for the tell-tale yellow spot that supposedly indicates a ripe, juicy interior. I knocked gently on the rind, listening for a hollow sound. I hefted the fruits and considered if they felt dense for their size. I did everything that the expert watermelon pickers tell us to do to guarantee a perfect melon on my table. My mouth was watering in anticipation of the refreshingly luscious fruit. On the 4th, I placed my watermelon on the kitchen counter and gave it one last affectionate thump before tackling it with my knife. I sliced that carefully chosen orb in half to reveal not a beautiful, crisp, red, sweet, juicy interior, but a disappointing, mostly white with a little pink marbled through flesh. It was bitter, not sweet. It wasn’t suitable for the pretty rind-on wedges I had planned to pile in my blue enamel bowl on the salad buffet for our cookout. It wasn’t suitable for anything that my time-crunched self could serve in just a few hours to my friends. My melon thumped as it hit the trash. So tell me, please. What did I do wrong? How do I ensure that the melon that I carefully select is indeed a ripe, red beauty? How do I get the perfect melon? Please, please, please share your advice, tips, and knowledge. I, obviously, need it. 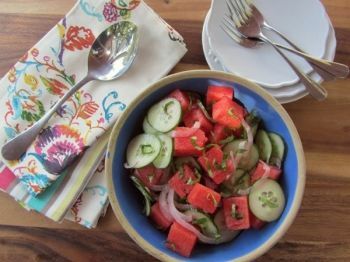 If you are lucky or smart enough to snag a great melon, this salad is an invigorating way to savor watermelon. Paired with the freshness of cucumber, the brightness of lime, the green of basil and enhanced by just a little salt, Watermelon and Cucumber Salad won’t leave you feeling as if you thumped your melon. Whisk together olive oil, lime juice, and salt. Toss lightly with the melon, cucumber, and onion. Garnish with basil before serving. (If basil isn’t available, adding lime zest to the dressing is a nice alternative.) Serves 4. I was recently told to completely disregard any coloring and choose solely on holding watermelon to your ear and listen not for a hollow sound when thumping but for a down the basement stairs sort of echo. Thanks, Sophie. Since the hollow sound hasn't panned out for me, I will try your basement stairs echo method. Here's to ripe and juicy melons in our future.